Registered in the UK, Israel and Cyprus, eToro is a multi-asset exchange platform that lets users trade in traditional stocks and shares as well as in major cryptocurrencies. In contrast to other crypto-exchanges, it offers a social trading feature, which means that users can simply mirror the trading strategies of the most successful users of the exchange. This makes the service ideal for beginner traders who perhaps don’t quite trust their own judgment yet, as does its simple interface and training mode. However, users should watch out for occasionally high spread fees and overnight fees (applicable to leveraged trades), which can often mean that they end up paying more than they might with other crypto-exchanges. They should also bear in mind that, as of writing, eToro doesn’t permit cryptocurrency withdrawals, so users will have to sell into fiat before being able to claim their profits. Compared to ‘standard’ crypto-exchanges (e.g. Coinbase, Kraken, Binance), eToro’s fee structure is a little different, and slightly complicated. It doesn’t charge trading fees in the way other exchanges do. However, you’ll pay something called “spread fees” when selling crypto, and when buying crypto using leverage (i.e., when borrowing from the platform to make a purchase). In other words, if you want to sell (or margin trade) a cryptocurrency, you have to pay a percentage of the sale price. This percentage comes from the ‘spread’ of the asset, which is the difference between its ‘buy’ price and its ‘sell’ price. For example, if you sell one bitcoin at a market price of USD 7,000, you’ll also have to pay 0.75% of the value of this one bitcoin (0.75% being the current BTC spread value at the time of writing). Assuming that 1 BTC equals USD 7,000, you’ll have to pay USD 52.50. And for any advanced trader taking out a leveraged position on a cryptocurrency, eToro also charges ‘overnight fees,’ which are often referred to as ‘rollover fees’ on other crypto-exchanges. Because the trader is borrowing money from eToro to hold a trading position, eToro essentially charges them interest. As the table above makes clear, overnight fees for BTC are pretty steep. By contrast, other crypto-exchanges are cheaper. For instance, Kraken charges 0.01% every four hours when holding leveraged BTC/EUR or BTC/USD trades. So, if someone has a trade worth 1 BTC on Kraken, they’ll have to pay 0.06 BTC if they hold onto this position for 24 hours, whereas an eToro customer would pay 2.589359 BTC. Similarly, the spread fees generally mean that trading buying or selling crypto on eToro is more expensive than trading it on other exchanges. For example, Binance and Bitstamp each charge 0.1% for every trade a user makes, which compared to eToro’s spread fee of 0.75% for BTC is noticeably cheaper. 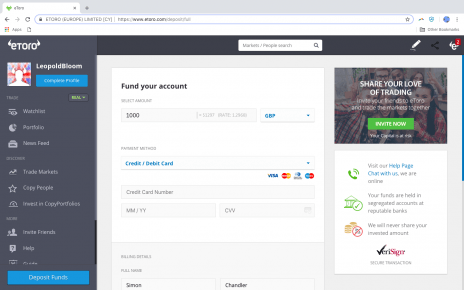 And lastly, eToro also charges withdrawal fees and inactivity fees. The withdrawal fee is a flat USD 25, with users being allowed to withdraw amounts of USD 50 and above. Meanwhile, the inactivity fee is USD 10 a month, and it’s charged to anyone whose account hasn’t been active for either four or 12 months, depending on whether they haven’t or have made a deposit, respectively. Founded in 2006, eToro has a history stretching further back than Bitcoin and crypto. It started its life by offering an online foreign exchange trading platform, and in 2010, it launched its famed copy-trading feature, which enables users of its platform to copy the investment strategies of successful traders. It made its first move into crypto in January 2014, when it began offering Bitcoin trading to the three million users it boasted at the time. At the time these were contracts for difference (CFD) trades, which means that the trader doesn’t actually buy the underlying asset (e.g., bitcoin), but rather reaches an agreement stating that he will either pay the difference if the asset drops in price, or will receive the difference if it rises. However, eToro switched to offering direct trades in crypto in September 2018, so you actually own the bitcoin or ether you now buy. Now, the platform boasts over ten million users, with its growth largely driven by the crypto boom. And fittingly enough for a platform of its size, its interface is streamlined and straightforward to use, while its mobile app makes managing your portfolio on the go painlessly convenient. While its website and platform have experienced no major issues in the past, security isn’t really eToro’s major selling point. This is mostly because, up until 2017, cryptocurrencies weren’t directly traded and transferred using the eToro platform. Instead, users held a contract for difference (CFD), meaning that they agreed to either pay or receive the difference if the price of a coin sunk or rose. In other words, eToro didn’t hold any crypto that was owned by its customers, so there was no need for it to use the kinds of security measure you might encounter with other crypto-exchanges, such as cold wallets and multi-sig verification. Now it does offer direct trades in crypto, but its website doesn’t make clear what crypto-specific security measures it takes to protect its customers assets. That said, it does keep its customers holdings separate from its own bank accounts, while it also deals only with major, internationally recognised financial institutions, such as Barclays Banks and Coutts. In addition, eToro is one of the most secure exchanges online in terms of its general compliance with financial regulation, being regulated by CySEC in Europe, FinCEN in the US, and the FCA in the UK. While eToro might initially seem to be focused more on intermediate and experienced traders, it offers a couple of important features that make it highly suited to novice traders. 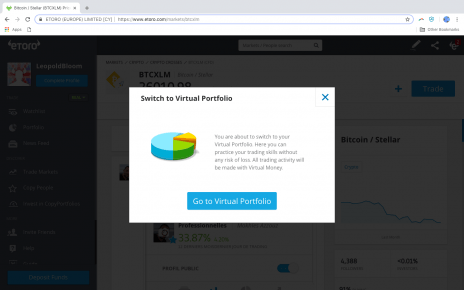 For one, it offers a Virtual Portfolio, which is basically a ‘demo mode’ that lets users trade without staking any real money. Using this mode, you can buy as much ‘virtual’ bitcoin, dash or ripple as you like and watch how each cryptocurrency performs. Secondly, eToro’s use of copy trading is great for those traders who, even with the Virtual Portfolio, don’t feel entirely confident in their ability to consistently select winners. With the CopyTrader system, eToro lets you copy the best-performing traders in a variety of asset markets (e.g., commodities, stocks, ETFs, and crypto). 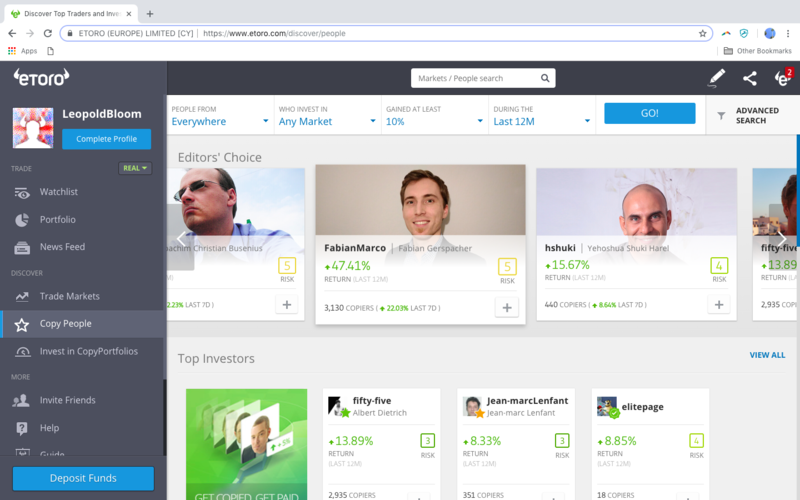 You choose how much to invest, and then eToro’s platform mirrors every action the trader takes, although users can make adjustments here and there (such as copying only new trades rather than all open positions). 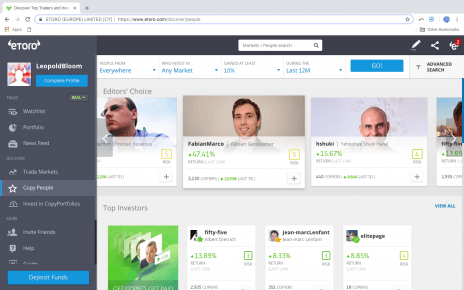 More generally, the layout of eToro’s platform is user-friendly and easy to navigate. The user sees a control panel on the left-hand side of the screen, while the right-hand side shows all the charts, data, and profiles you’ll need to make your investment choices. Similarly, the eToro mobile app lets you do pretty much everything you can do on the desktop version of the platform, while the ability to receive notifications arguably means you’ll stay even more on top of your trades than you were before. At the moment, eToro users can deposit only fiat currency into their accounts, although doing this is easy enough. They can use their credit/debit cards and a variety of other options, such as wire transfer and PayPal. All fiat funds held by eToro are actually in US dollars, so even if you deposit EUR or GBP into your account eToro will convert this into USD, which will obviously mean you’ll incur a conversion fee. Withdrawals work in much the same way, with credit/debit card, bank transfer and PayPal options all available. However, there is a flat fee of USD 25 for every withdrawal, so users should make sure they group their withdrawals together as much as possible. 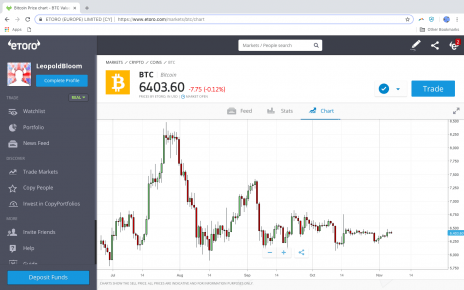 In late 2018, eToro has released its eToro crypto wallet where platform users can actually withdraw cryptocurrencies it supports. Cryptoassets are unregulated and can fluctuate widely in price and are, therefore, not appropriate for all investors. Trading cryptoassets is not supervised by any EU regulatory framework. Past performance is not an indication of future results.